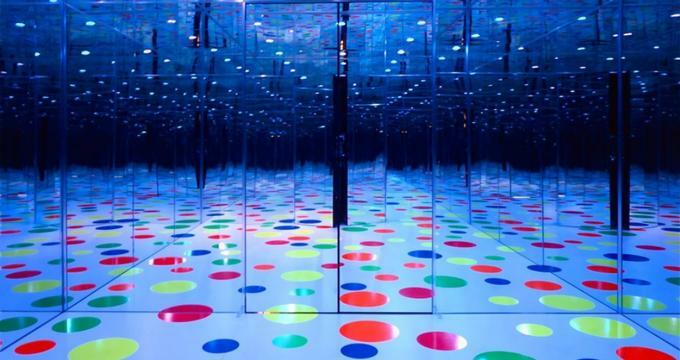 Located in the Mexican War Streets neighborhood of Pittsburgh, the Mattress Factory is a contemporary art museum highlighting site-specific installations by artists in residence. The Mattress Factory was founded by Barbara Luderowski, a Pittsburgh artist. In 1975, Luderowski purchased the Stearns and Foster warehouse, a former mattress warehouse located in the Mexican War Streets neighborhood of Pittsburgh's North Side, as a means of housing an artist community. After two years, the facility had grown to an exhibition space and small food co-op, which led to its establishment in 1977 as a nonprofit corporation. In 1982, the museum's first art installation opened. Since then, much of the museum's focus has been on installation art and other alternative art forms, such as video and performance art, Hosting more than 75,000 annual visitors, it is recognized as an international leader for site-specific art, presenting new works from regional, national, and international artists. Works by more than 650 artists have been featured, many working through the museum's artist-in-residency program. The museum has also been a major catalyst for the revitalization of the North Side area, rehabilitating nine properties here, including two buildings for artist residences and several more for permanent gallery spaces, and fostering substantial community outreach. As a research and development lab for contemporary artists, much of the museum's exhibit space is dedicated to commissioned site-specific installations produced as part of its artist-in-residency program. Works presented through the program have been featured in international publications such as the New York Times and Wall Street Journal and have served as catalysts for launching the careers of major American and international contemporary artists. Selected installations are preserved as part of a permanent collection. Most prominent is Winifred Lutz's Garden Installation, housed in a lot adjacent to the museum that was once home to the Italo-French Macaroni Company. Lutz spent five years researching the history of the Macaroni Company and other neighborhood factories prior to creating her 1993 installation, which incorporates the former foundation of a building on the site destroyed by fire. The installation is constructed in the form of a city neighborhood courtyard garden, with a trellis, stone walls, and a concrete trough housing a water sculpture. Stones transported from a western Pennsylvania quarry and newly planted indigenous trees and wildflowers complete the urban garden installation. Rolf Julius' Music For a Garden was composed specifically as complementary music for the Lutz installation, broadcast from three speakers on the museum's exterior walls. Hans Peter Kuhn's Acupuncture is a light sculpture that pierces the building's roof and south exterior wall, visible throughout the neighborhood. Other pieces by Julius are featured in the permanent collections, along with a number of full-room exhibits, including Bill Woodrow's Ship of Fools: Discovery of Time, preserving a moment of chaos in a turn-of-the-century kitchen, and the Infinity Dots Mirrored Room by Yayoi Kusama. Allan Wexler's Bed Sitting Rooms for an Artist in Residence turns living quarters for artists in residence into a permanent installation, and an installation by Greer Lankton, It's all about ME, Not You, uses the artist's dolls and figures to create a "white trash" recreation of a Chicago studio apartment. In addition to the museum's exhibits, the Mattress Factory Cafe, available for visitors without museum admission, features an outdoor patio and serves fare from the chefs at Lawrenceville's Coca Cafe. The museum's gift shop features art and craft works by local Pittsburgh artisans as well as art supplies, encouraging visitors to produce their own works. In 2003, the museum opened its Education Studio, a fully equipped facility for workshops and community programming. More than 20,000 area students and teachers are served by the museum's educational programming, which includes the free drop-in INSTALL: Afternoons @ the Factory program, promoting themes of collaboration and tolerance to participants. Monthly Saturday morning programming is divided between the Mini-Factory program, geared toward children ages 3-5, and the ARTLab program, which opens the museum to drop-in visitors of all ages, encouraging visitors to explore their creativity and participate in activities inspired by current installations. A Teen Art Cooperative program gives area teens the opportunity to collaborate on contemporary art projects, learn from local artists, and plan museum events. For younger students, a Community Art Lab is offered as part of summer camp programming for ages 7-13, providing participants with an opportunity to exhibit their work at a special wrap-up event. Guided tours for students are offered on a variety of topics, focusing on open-ended discussion and reflection. A school partnership series presents teaching artist residencies, Installation Labs, and other programs to area public schools, while teacher workshops help area teachers make connections between curriculum requirements and contemporary art education.